Pinoy Big Brother Season 5 in 2014! Pinoy Big Brother audition schedules, the dates for both teens and regular edition schedules, have already been announced. Venues however are yet to be revealed. The 1st stop of auditions will be in Davao at the Abreeza Mall to be held later this month, October 26 for those age 12 to 17 years old and October 27, for 18-35 years old. On January 18, 2014, there will be an audition but for the regular edition only. 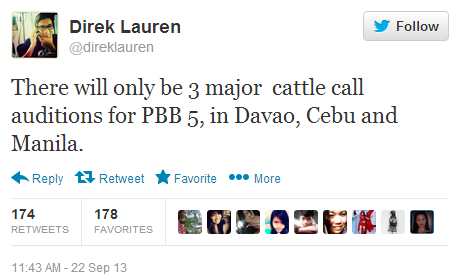 It will be held at the PBB Eviction Hall in Quezon City, from 7:30AM to 3:00PM. Mykiru will be updating this page regularly as soon as more audition dates and venues are announced. This is now your chance to be a housemate of Pinoy Big Brother and be like Kim Chiu, Ejay Falcon, Slater Young, Myrtle Sarrosa, Melai Cantiveros, Beatriz Saw, James Reid and Nene Tamayo who all emerged as Big Winners of the show in its previous 4 seasons and 10 editions. The last edition of PBB was a teen edition in 2012, with Myrtle as the winner. Celebs like Sam Milby, Gerald Anderson, Zanjoe Marudo, Robi Domingo, Tom Rodriguez, Sam Pinto, Jason Francisco, Jon Avila, Matt Evans and Ryan Bang also became popular after joining PBB. Other popular celebs who also joined and competed as a Pinoy Big Brother housemate include Jason Gainza, Wendy Valdez, Paul Jake Castillo, Bianca Gonzales, John Prats, Will Devaughn, Riza Santos and even the newly-crowned Miss World 2013 Megan Young.